For new artists, buying art supplies, especially paint, can be overwhelming. With hundreds of brands, sizes and qualities to choose from, many wonder where to begin. Follow the tips in this article to jump-start an art education. Originally used in Renaissance-era fresco painting, tempera remains very popular in elementary schools because, unlike watercolors, acrylics and oils, tempera is non-toxic. Though everyone is familiar with the student-quality versions, opaque egg tempera is available for artist-quality use. Great care should be exercised when using liquid tempera, as the paint dries very quickly once exposed to air. Tempera paints are available in liquid, cake and economical powder form. Pan watercolors, which come in trays of dry to semi-dry pigment cakes, are easily transported and best suited for outdoor use. Tube watercolors are typically heavy-bodied, good for opaque applications and should be diluted with water before use to avoid cracking. Liquid watercolors, which come in bottles or small jars, are best used for transparent coverage. Watercolors dry quickly and clean easily with soap and water. Heavy-bodied acrylics are typically higher quality and the most versatile, able to be thinned with water or applied thickly without cracking. Liquid acrylics are thinner than heavy bodied acrylics and are better suited for watercolor-like applications. Acrylic gouache (say ‘gwash’) can be applied to a variety of surfaces and so is typically used in craft projects. Because white gesso is made with acrylic binders and a titanium dioxide pigment, there is little difference between it and unnecessarily expensive white acrylic tube paints. The traditional choice of fine art painters, oil paint is available in tubes or bulk cans. Though complex in composition, oil paints still essentially have two parts: a pigment and a binder made from a drying oil like linseed or walnut. Since drying time can vary with color and application density, oils can take anywhere from six months to one year to fully dry. However, drying mediums can be added to quicken the process. Most oil paints are heavy bodied and require a thinning agent, such as additional linseed or walnut oil or artist-quality turpentine, for most applications. Oil paints must be cleaned with turpentine or mineral spirits. From the brightest and most brilliant colors (hues), all others are possible. Granted, it’s easier to buy a beginner’s set of paint, flushed with varying tints and shades, but new artists should take the time to experiment from scratch. Understanding how colors interact is an essential part of becoming an artist. That said, for large-scale paintings that will take days or even weeks to complete, it is worthwhile to buy specific tints and shades of color. Without precise measurements, replicating exact colors is at best difficult. It’s a common misconception that it’s easier to darken a color than lighten it. For example, to turn ultramarine blue into a turquoise, just add white (called tinting). The blue is still blue, only lighter. However, it is much more difficult to turn a turquoise into a deep-hued blue. Simply adding black (called shading) dulls the color, turning it from blue to gray. Deep-hue colors offer the best flexibility for color mixing. More on the color black: For most painters, black is rarely needed. A blue or purple mixed with a brown is a great substitute for, and will often look better than, a straight black. Typically, primary colors with the deepest hues are the most expensive. Side by side, two colors of tube paint could look nearly identical, but carry significant price differences. Cheap acrylics and oils have a higher binder to pigment ratio than professional-quality paints. Paints with less pigment typically don’t cover well, often requiring many coats to achieve a brilliant hue. While this may not be as important with transparent watercolors, it is an issue with opaque applications involving acrylics and oils. Though it’s best for beginning artists to buy affordable paints, the cheapest are simply not worth it. 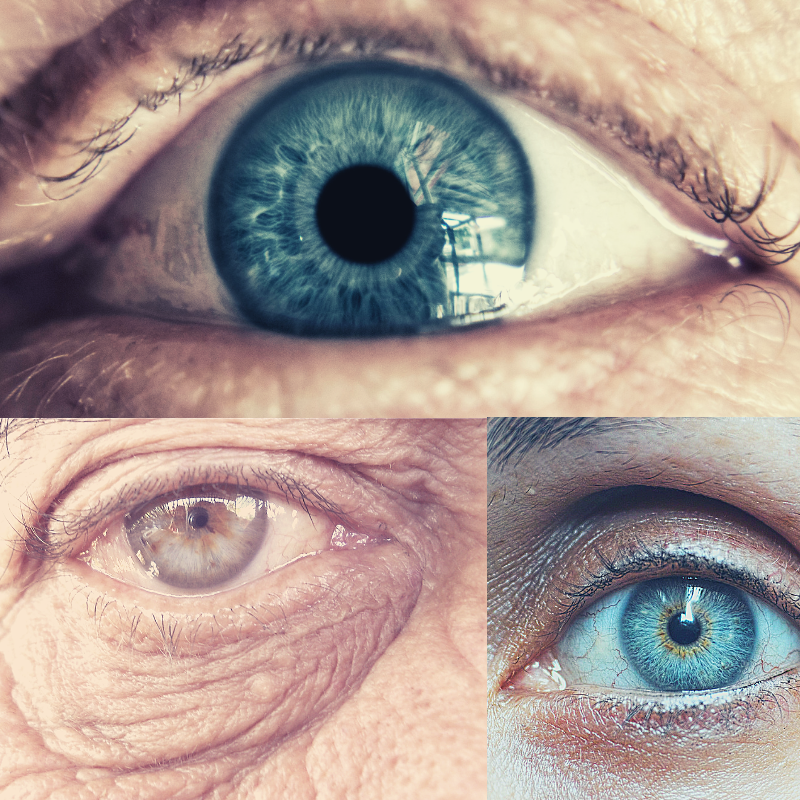 Everyone has heard of the term ‘cataract’ and most people know someone who has had cataract surgery. But cataract is a term that is very widely misunderstood. When I ask people if they know what a cataract is they invariably reply that it is a skin or film that grows over the eye when you get old. A better explanation is that just behind the iris and the pupil (which is actually a hole) there lives a lens that can change shape to allow us to focus at different distances. As time goes on, this lens, which is completely transparent at birth, begins to go yellow/brown and cloudy and this is called a cataract. At a certain stage it gets to the point where the cloudiness is affecting the vision so much that a person with the condition needs to have it corrected either by surgery or through the use of prescription eyewear. Thankfully, through the advancements in ophthalmology, safe yet value-for-money contact lenses are readily available. The video below explains what happens if a person has cataracts. Nowadays cataract surgery can be carried out as a day case procedure (meaning you don’t stay in hospital overnight), through a very tiny incision, under local anaesthetic (which is good because when a person has a general anaesthetic, it considerably increases the risks to the patient) and a new replacement lens in inserted. Intraocular lens implantation is a procedure that uses ultrasound to disintegrate the cataract, but there is now an option of using a laser for both the initial incision and the cataract disintegration. After the lens of the eye is removed, the replacement lens is inserted to correct the vision problems. If an intraocular lens is not implanted after the cataract is removed, special contact lenses are prescribed. The patient even has the option to choose prescription contact lenses that enhance eye color naturally. As an artist, I am very particular about eye health. Vision is important to every artist out there. So for our succeeding updates, this site will also explore the different options for cataract surgery, the advances in intraocular lenses (the replacement lens that is inserted), whether special eye drops can be used to prevent the need for surgery, what are the causes of cataract and whether anything can be done to slow down its progression. If you would like to ask a specific question about cataracts that you want me to address, or if you would like to share your own or your family member’s experience of cataract surgery, please use the comments section to be in touch! Most artists enjoy trying new materials. 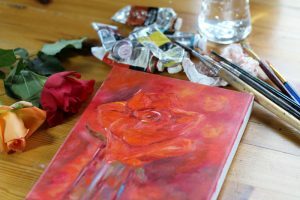 Here are some alternative surfaces for painting in oils. Most are easily found in art supplies sources. Stretched canvas is the most common surface for oil painting. Canvas practically defines the genre. Let’s face it, people are used to seeing paintings on canvas stretched on frames. It may be traditional, but stretched canvas is NOT the only surface that artists can use for painting in oils. Paper as a support for oil paintings has never really taken off. There are a few good reasons for using paper materials, but also potential bad problems. Paper is light in weight and less expensive to use. Also, paper supports take up much less space than either canvas or panels. These features make paper materials seem like a good option. All paper supports need a barrier between the paper and the oils, such as acrylic gesso or acrylic varnish medium. Without question, only acid-free or rag products should be attempted. There is some question as to how archival paintings on paper will be as they age. These supports tend to be flimsy and may lead to cracking or damage to the oil surface as it hardens. Museum board or illustration board is a multi-ply cardboard-like paper with a nice surface for artwork. Canvas paper has a prepared canvas-like texture and is available in pads. Various cardboards can be coated and painted on, but cardboard is noted to be susceptible to dampness and breaking down quickly. Watercolour paper or bristol paper is archival, but the flimsiness doesn’t bode well for a hardened oil surface. Panels are attractive support for artists. They are thinner and take up less space than stretcher frames. The solid surface may be better suited to oil painting preservation. And wooden panels are common to the tradition of oil painting from the Renaissance on. All panels must be coated before painting on with oils. Artists have been painting on Masonite or hardboard panels for long enough now that they are considered archival. The disadvantage to these panels is that they may warp. Large size panels need to be braced or framed. Smaller panels up to about 16 x 20 are usually not braced. Plywood is a tempting large, smooth surface. However, plywood is susceptible to separation of layers and splitting along the surface. Wooden boards are seldom wide enough alone and joining boards together to create a larger surface may lead to splits in the surface much later. less desirable for oil painting. The unstretched canvas can be taped to a lightweight firm backing, such as gatorboard or foam core, and then painted. After it is painted on, it may be simply stored flat, transferred and mounted to a hard panel surface, or stretched onto a frame. There are many reasons for seeking alternative support materials. Convenience, weight, storage, and aesthetics are some of the motives. Stretched canvas paintings remain the most common supports, but artists are wont to experiment. As long as the materials are prepared specifically for oil paint qualities, there is a great degree of success in using alternative materials for supports. Artists in the market for a new easel for their art studio may be stunned by all the choices. There are metal easels, wooden easels, A-frame, H-frame and French easels and all types of features that may make the easel more attractive to certain types of artists, and useless to others. Here is a guide to help even new artists weed through the choices to find the perfect easel for their needs. 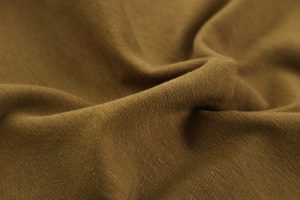 When it comes to the material choices, one is not necessarily better than the other. Wood is a classic choice for easel construction, but metal has many advantages as well. What Types of Easel Styles Are There? If an artist looks hard enough, she will find an unending amount of various sizes and styles of easels. There are three main styles, though. A-frame or tripod easels are shaped like the letter A with an extra leg jutting out to support it. This three-legged structure makes it easy to fold up for storage. The problem with A-frame easels is the lack of support on the upper part of the canvas. Also, this type of easel isn’t a stable as other easel types, though they are often less expensive than H-frame counterparts. H-frame easels have a square-shaped frame with a crossbar or tray that runs along the center to hold the canvas. H-frame easels are very sturdy and support the canvas from top to bottom. The only problem with this style is that it takes up a lot of room. Space conscientious artists should look for a version that folds flat so that it can be stored against a wall of the art studio or under a bed. Both the H-frame and A-frame easels come in large floor sizes or smaller table-top designs. French easels are small boxes or cases with pop-up painting supports and extendable legs. 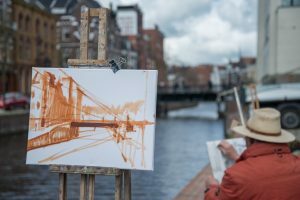 These types of easels are made for plain air painting since artists can store their supplies in the easel and carry it to various locations easily. Telescoping legs make A-frame styles take up even less space. how large of a canvas the easel will accommodate. Look for built in trays and cups for holding art supplies. Make sure the canvas support bars are wide enough to hold deep, gallery-style canvases. Rubber tipped feet keep tripod and A-frame legs from slipping during the painting process. 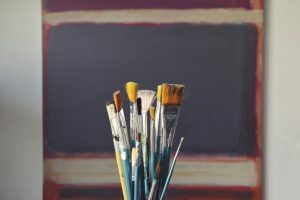 After considering all of the easel’s features and options, an artist will be able to make an informed decision when buying this high-ticket item for his art studio. Sketching with watercolor paints instead of traditional dry media can give you the advantage of colorful, textured sketches that offer a more complete impression of a scene. 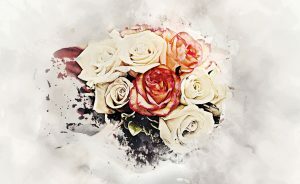 Here are some tips for getting started with watercolor sketching. The first key to sketching with watercolor is to keep your hand loose and use big, sweeping strokes. This will speed the sketching process and leave you with the feeling and composition of a scene without taking too much time. Remember, you’re not trying to make a painting worthy of a frame. You just want to record what you see for a complete painting in the future. One of the best reasons for sketching with watercolor instead of sketching with dry media is simplicity. Broad strokes and a loose hand will keep your sketch spontaneous, but you may still fall into the trap of over recording. To combat this, always use the biggest brush possible. Using a larger brush will help you record the big picture, not all the fussy little details, keeping you more focused on capturing the atmosphere and composition of the moment. If you are a stickler for details, go ahead and paint them, but not with your composition sketch. Do separate sketches of the details that catch your eye. For example, if you are sketching a busy farmer’s market you should paint an overall composition sketch, a sketch of the gourd display, a sketch of the intriguing older lady, a sketch of the farmer’s dog…you get the idea. Your first instinct may be to cover your white paper with color, but not so fast. Use the white to your advantage. Use it to signify light in your sketches. The pure white paper can be highlights, sun bleached areas or just a visual note to yourself to leave an area lighter in color. Nothing is more distracting than having a jumble of painting tools that you don’t really need. Keep it simple. Follow these tips as you fill the pages of your watercolor sketchbook and you will end up with sketches that are useful references for your paintings.